An anonymous reader suggested to use a billboard to warn road users. 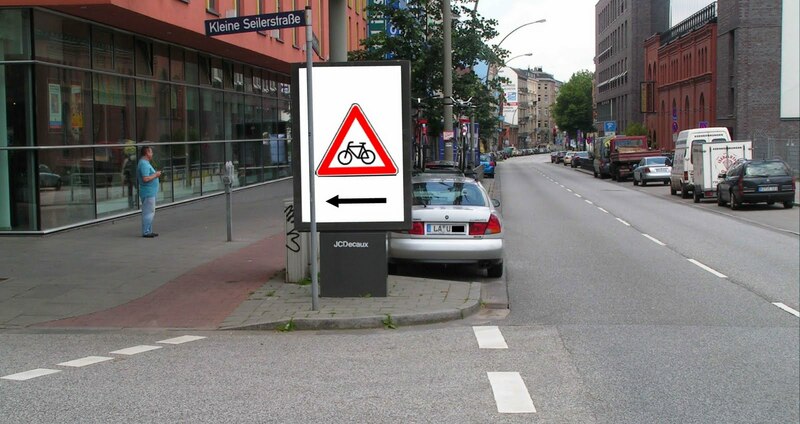 Here my idea how to make traffic safer with billboards all around in the streets. Improve the billboards. Todays billboard kindly shows the risk. Yesterdays billboard only hides upcoming cyclists. 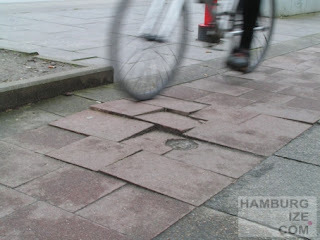 For several month a rather new Hamburg cycle track close to my home was veiled behind a construction site. 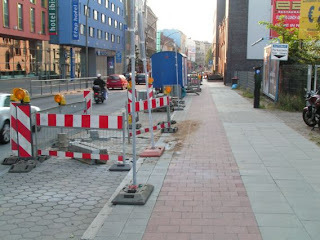 Now the cycle track is born again since a few weeks. Another Hotel completes the site, now four hotels are next to the cycle tracks, and in front of each hotel the sidewalks are so tiny that pedestrians are always on the cycle tracks. The road lanes are not affected of course. Latest redesigned part of the cycle track at new hotel. 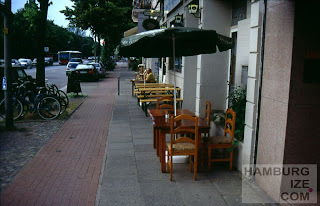 At the newest hotel the parking lots are widened, cycle track is moved towards the new building and the sidewalk became smaller, a bench to watch cyclists and some flower buckets. Hotel site with the straight road lanes. Some years ago on the opposite side some advertisement was placed just between cycle track and road lane at a crossroad, where now visibility between cyclists and car drivers is affected. 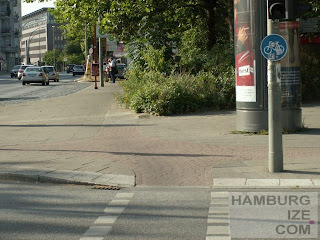 The City and the police don´t want to remove advertisement. Since 2007 I am waiting for the first victim. 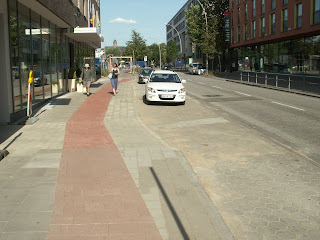 The cycle track close to the buildings. Some years ago with the former straight running cycle track. 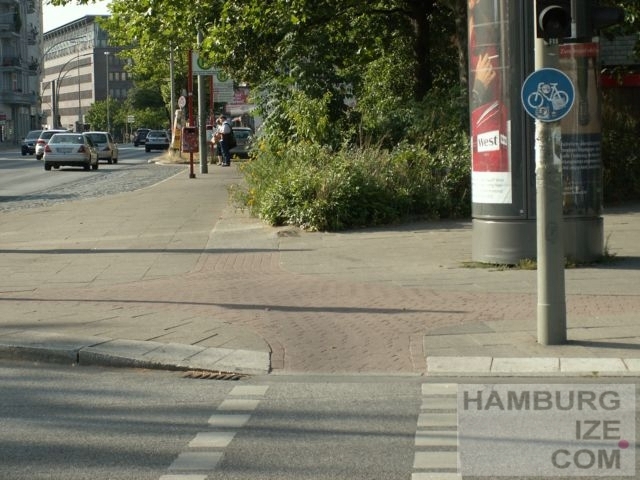 Billboard hides cyclists coming up. 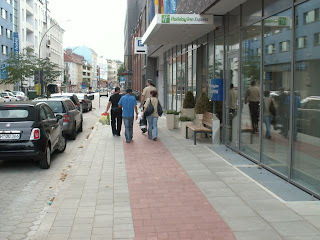 The hotel-line, the cycle track along the hotels is often affected, and the sidewalk too of course. 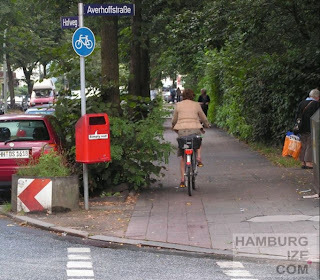 Gute Sichtbeziehungen zwischen Radfahrer/innen und anderen Verkehrsteilnehmer/innen sind für die Verkehrssicherheit von entscheidender Bedeutung." Untitled from Stefan Warda on Vimeo. 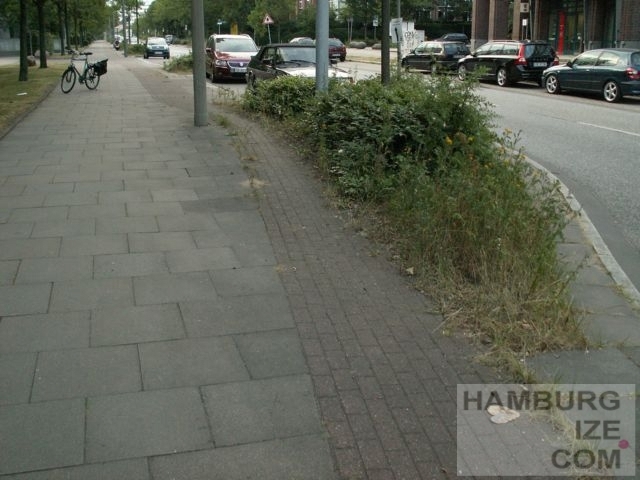 Green City - Hamburg wird "Umwelthauptstadt"
Lübecker Straße in July 2010: This green cycle track got a new design only a few years ago to go along with the German regulations combined with the obligation to use a cycle track. 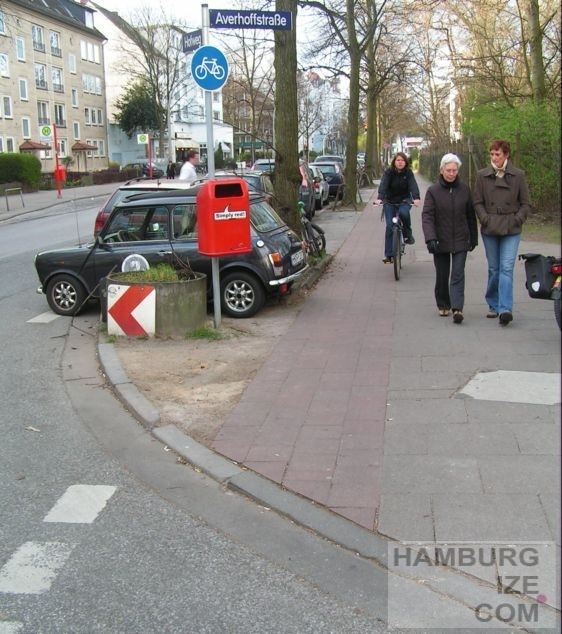 As long as a cycle track has to be used it should be two meters wide and should be maintained. 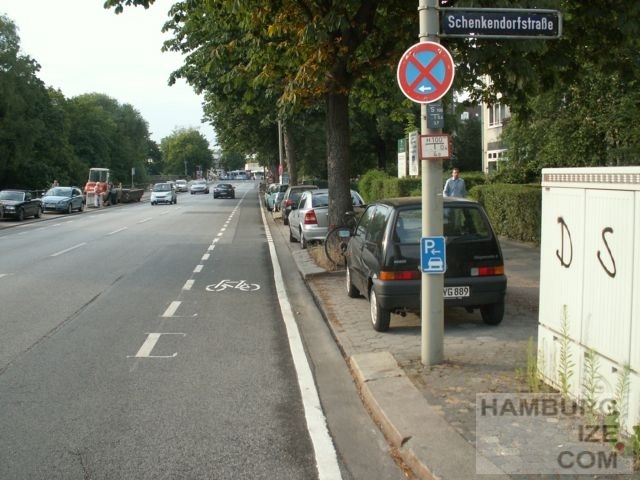 The City of Hamburg lists this cycle track as one of the good examples of new cycle tracks built with special funds of the bicycle strategy for Hamburg from 2007/2008. Hamburg is a green waterside metropolis. The Hamburgers love their parks and the many trees in the streets. As always in summer Hamburg becomes the green city. Then no other metropolis in Europe has so many green cycle tracks than Hamburg. 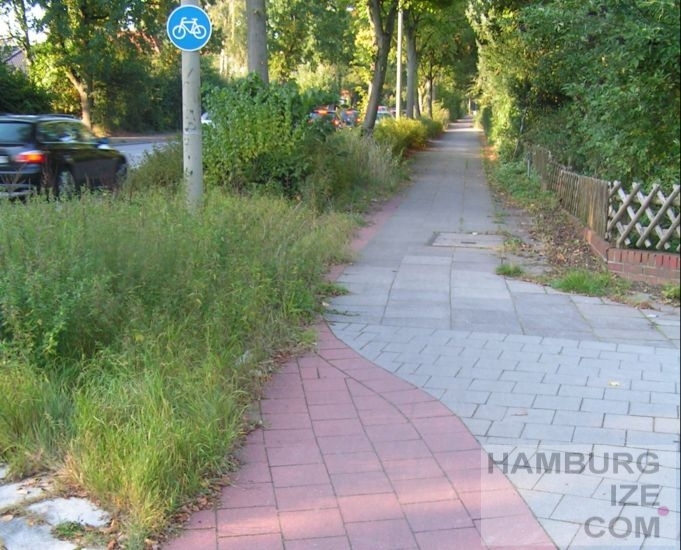 Next year Europe will visit Hamburg and discover Hamburgs invention, the green cycle track. 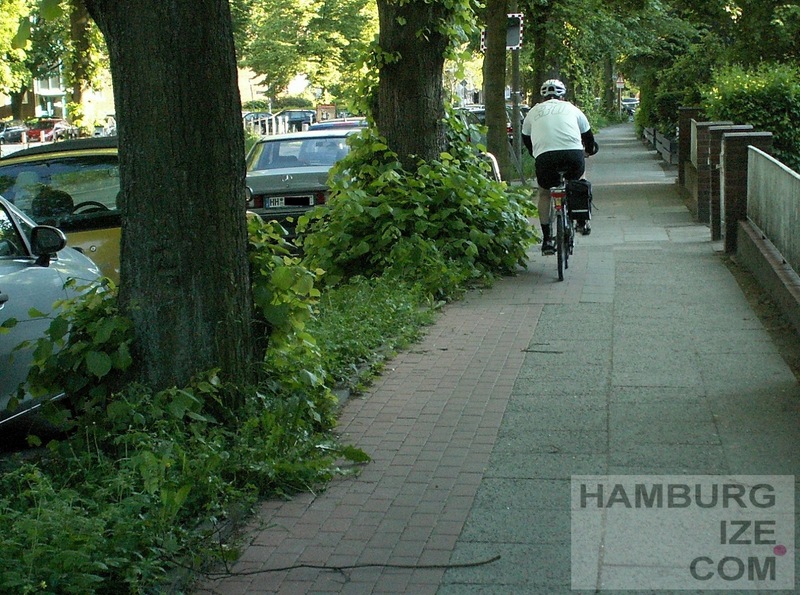 Compared with other cycle cities Hamburg is ahead in designing the streets. 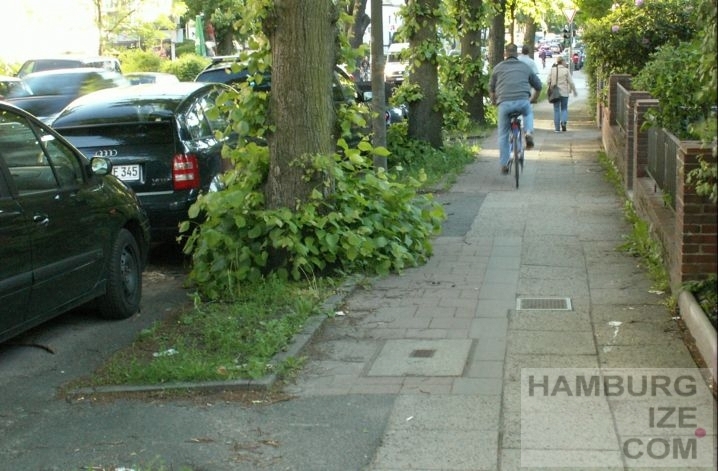 Copenhagen for example has narrow streets only with road lanes, broad cycle tracks and sidewalks, but the streets in Hamburg even have lots of trees and parking lots additional. Lehmweg in July 2010: Cyclists take care of the old green cycle track. Cycle track without obligation to use. Cyclists in Hamburg know what to do with green cycle tracks. 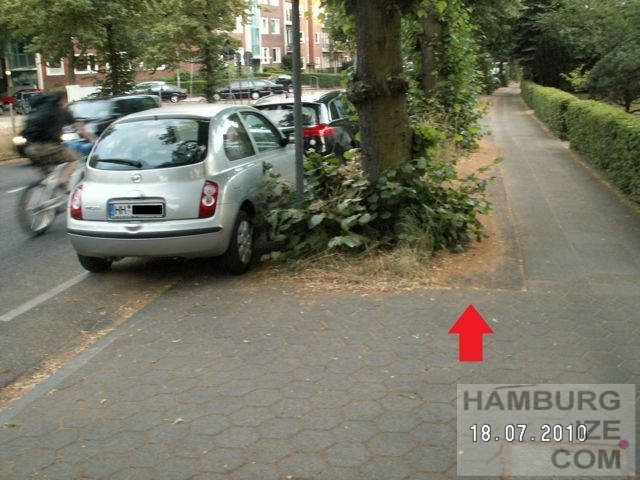 Visitors can watch cyclists all around, but not on the cycle tracks. 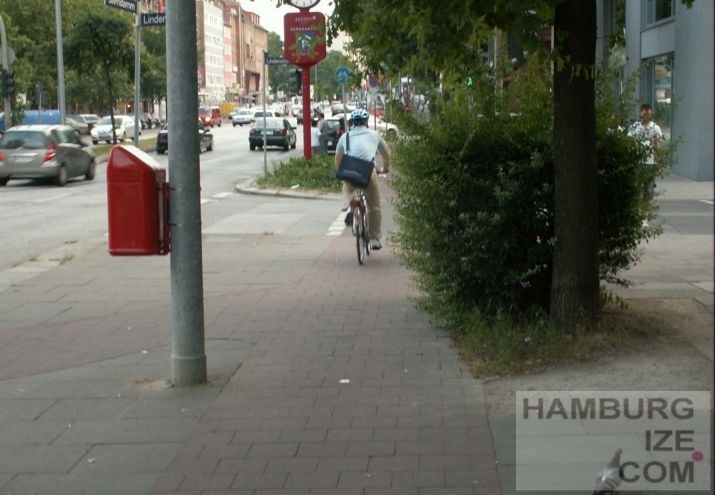 It´s very common to cycle on the sidewalks next to the green cycle tracks, and some cyclists take the road lanes to keep the green cycle tracks safe. 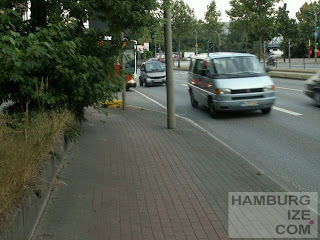 Visitors won´t understand why the police allows cycling on the sidewalks next to the green cycle tracks in the face of German traffic rules. 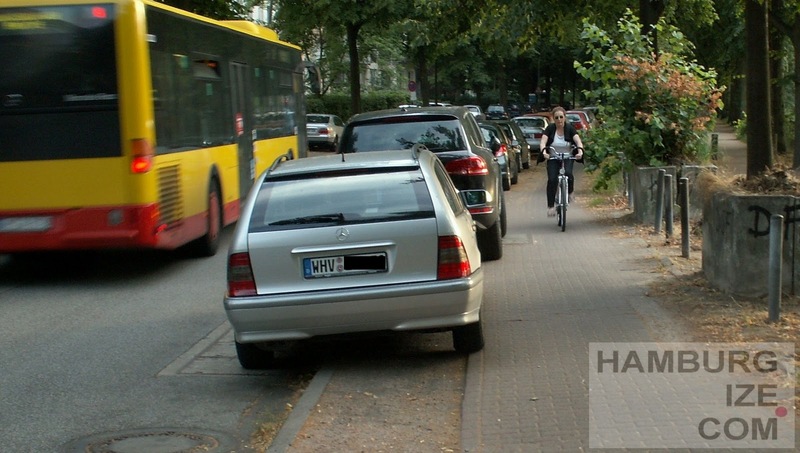 Cycling on sidewalks is not allowed generelly. It seems schizophrenic, but if cyclists will be caught on other sidewalks without green cycle tracks besides they will be sentenced. 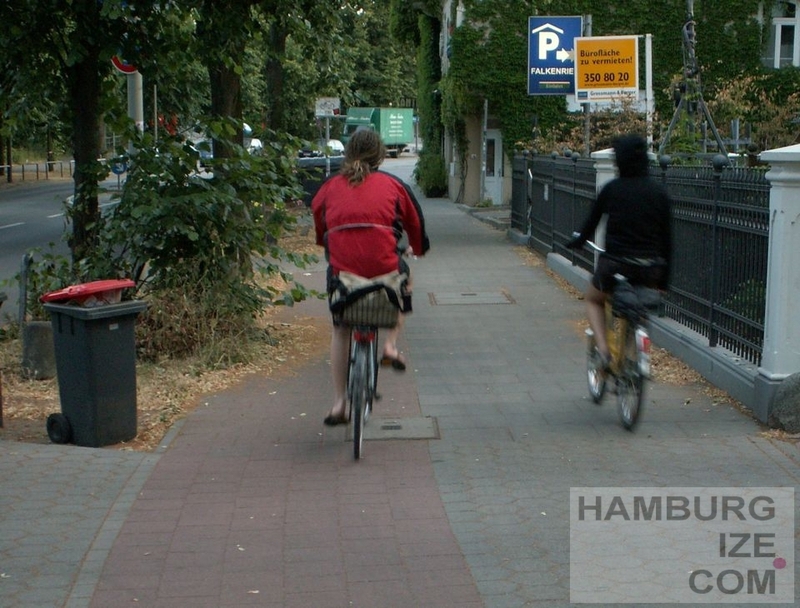 Visitors will need some time to get familiar with Hamburg´s secrets of cycling, so be prepared until you will visit Hamburg in the year of being the European Green Capital. Ulzburger Straße in 2008: Rather new, and the greenest cycle track of Hamburg, with obligation to be used. Take care about it. 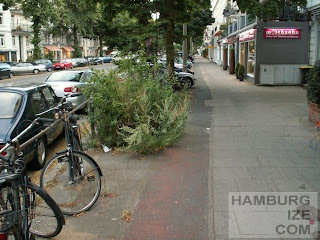 Maria-Louisen-Straße in July 2010: Green cycle track has to be used. 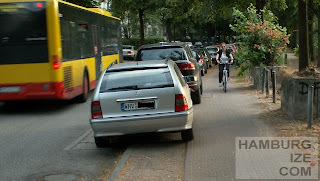 Maria-Louisen-Straße in June 2010: Cyclist besides the green cycle track with obligation to be used. 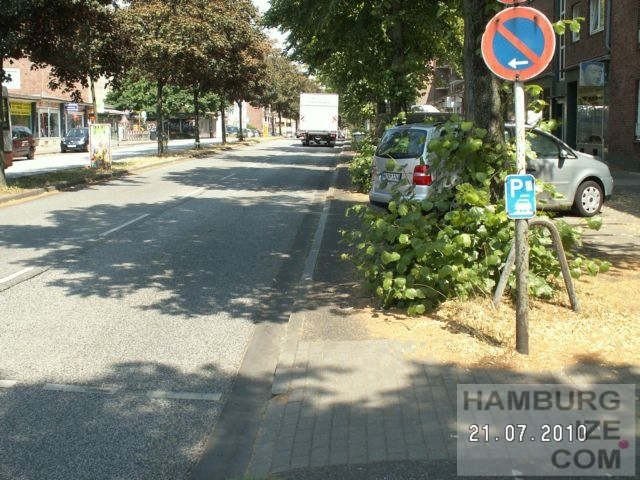 Maria-Louisen-Straße in June 2010: Cyclist is gentle and keeps distance to the green cycle track with obligation to be used. 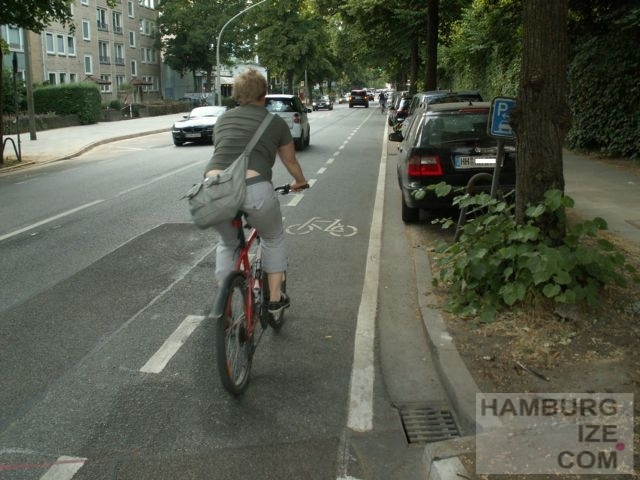 Maria-Louisen-Straße in July 2010: Hamburg invented the green cycle track. 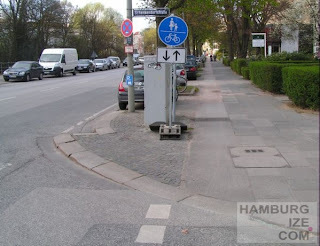 The green cycle tracks secret is the wideness. They can be so small that you will never find it. 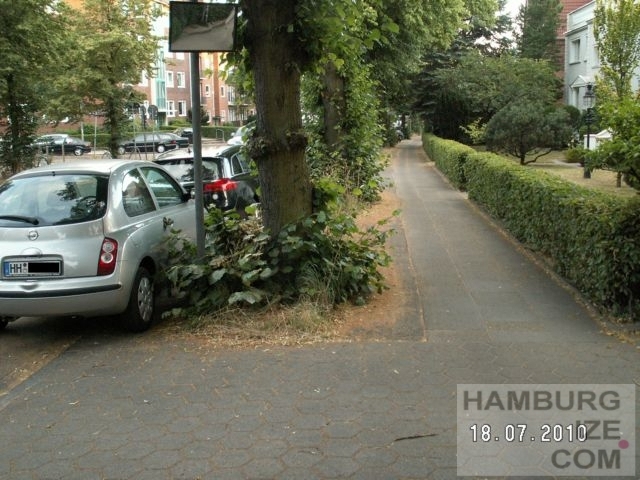 But at least they exist and Hamburg can offer many trees and lots of parking lots in the streets, more than other cities do. Look out for the little mirror next to the tree. 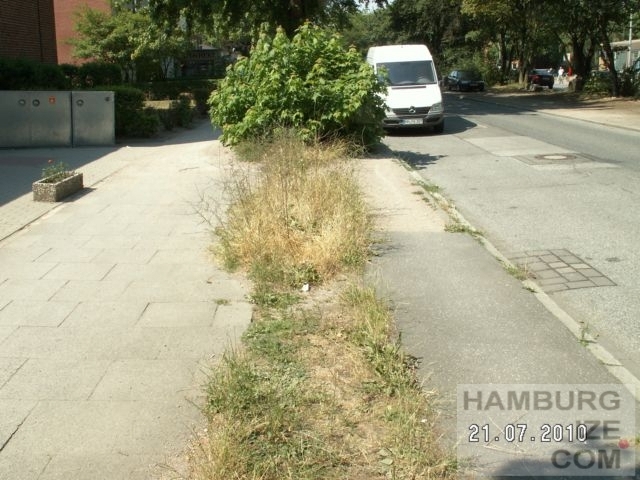 Maria-Louisen-Straße in July 2010: As a little help the green cycle track is marked on this picture. Only a few cyclists take the road lane. 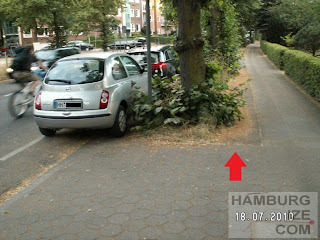 Here I let out another secret: More than a decade ago the former cycle track had been where the parking lots are today. 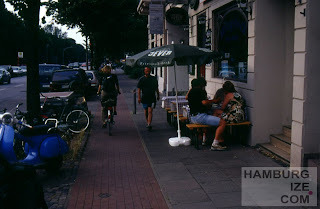 At that time todays green cycle track had been part of the sidewalk. Many cycle tracks have been convertes into todays parking lots over the last decades. Maria-Louisen-Straße in July 2010: Most of the cyclists take the sidewalk besides the green cycle track. Hammer Landstraße in July 2010: This green cycle track has the obligation to be used into both directions. 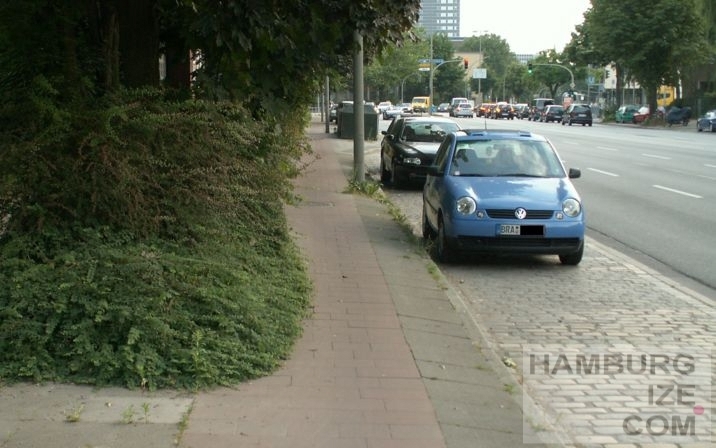 It is layed out for a wideness of 1.20 meters. 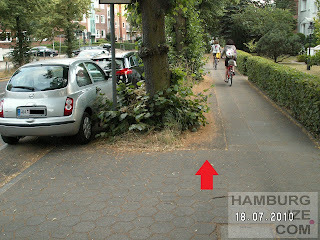 Cyclists in Hamburg are very talented to pass without running into each other. Hammer Landstraße in July 2010: The same green cycle track from the beginning, 1.50 meters wide. 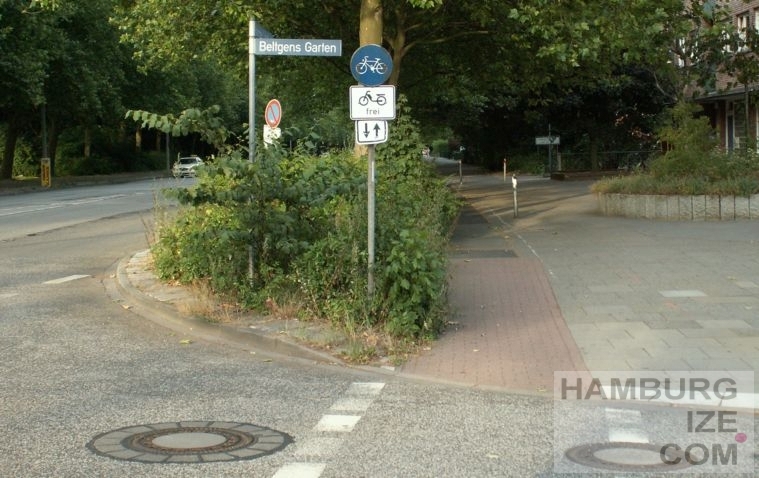 Eilenau in July 2010: Another green cycle track with the obligation to be used into both directions. 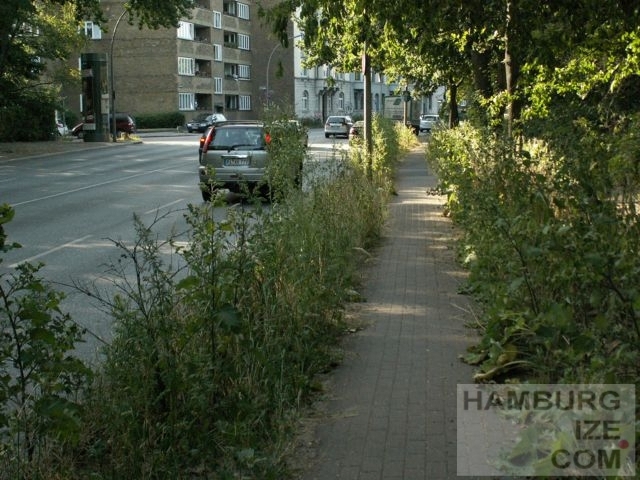 Kieler Straße in July 2010: Lovely green on both sides of the cycle track makes the cyclists feel much better, if there are no nettles. Obligation to be used. 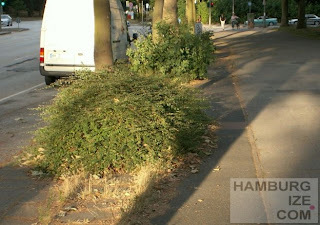 I know this green cycle track in this condition about more than 15 years. 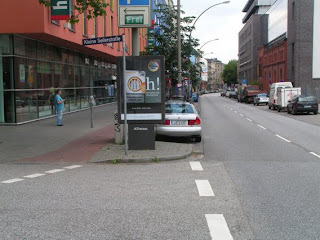 Holstenstraße in July 2010: The traffic sign shows the obligation to use the green cycle track. Very reliable, every year upcoming in wonderful green. 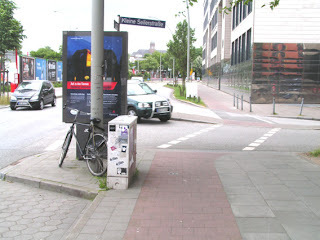 Nagelsweg in July 2010: Savannah on the cycle track without obligation to be used. Cyclists are invited to pick off some grass and make fantastic bouqets for their friends. Nagelsweg in July 2010: No obligation to use this lovely little curve of green cycle track. Steindamm in June 2010: Also very reliable, helps pedestrians to hide. 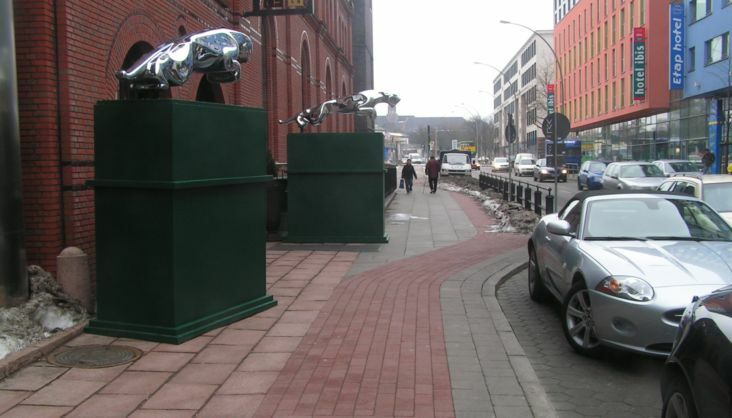 When the run after the green light to cross the main road they run from the right to the left and play with the cyclists. Amsinckstraße in July 2010: Attention for cyclists. Every year try limbo on the cycle track near the headquarter of the German automobile association, of course with obligation to be used. 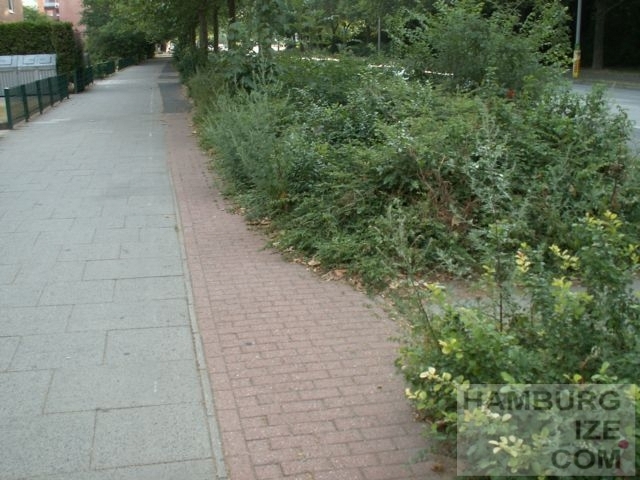 Hammer Landstraße in July 2010: Old green cycle track with obligation to be used. 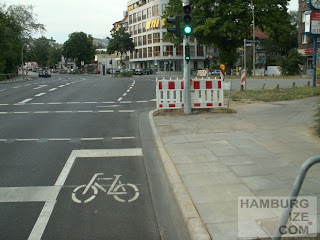 Friedrichsberger Straße in July 2010: Green cycle lane with obligation to be used. 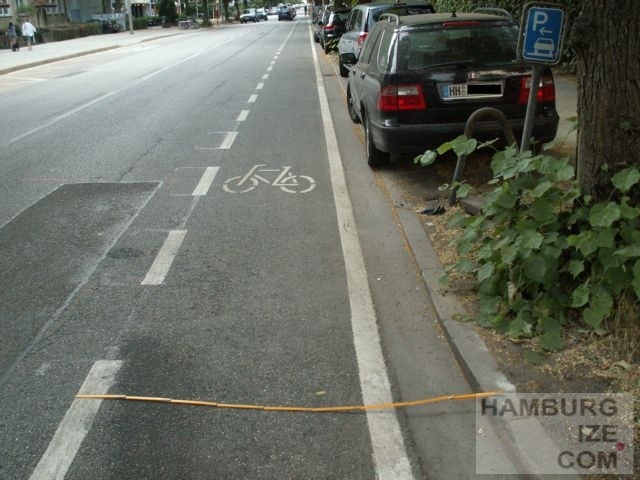 Try it with a cargo-bike. Lehmweg in July 2010: No obligation any more to use this nice and meager green cycle track. 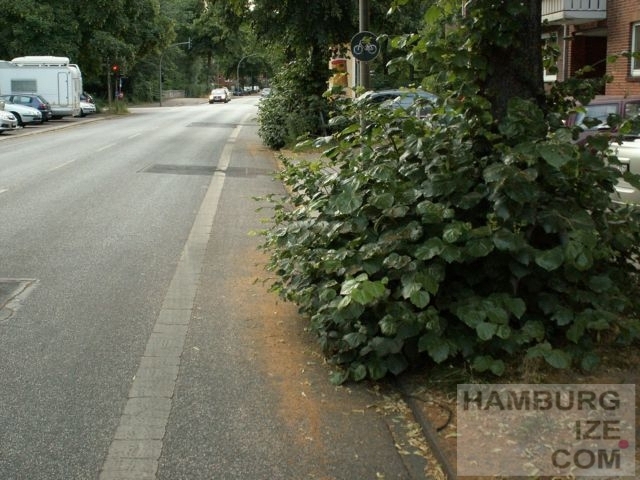 Isn´t it astonishing how wide streets can be with such a bonsai-like cycle track? 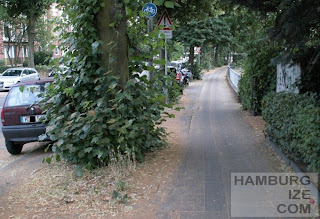 Sievekingdamm in July 2010: Between tree and curb the little green cycle track is located with the obligation to be used. 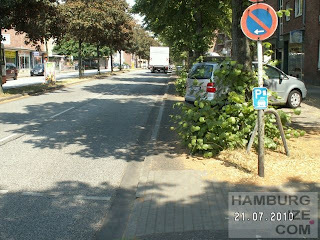 The police station is located in that street and keeps watching out for the blue traffic signs with the white bicycles. Sievekingdamm in July 2010: Also here between tree and curb the green cycle track with the obligation to be used. 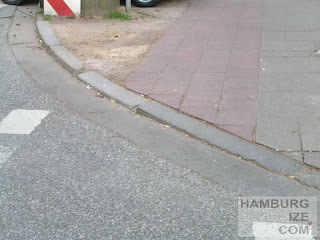 Even parking lots can be arranged. 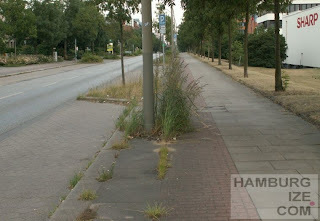 Washingtonallee in July 2010: Here you can see the future for many of Hamburg´s cycle tracks. Cyclists are here allowed to use the sidewalk on the left, they can even try to use the cycle track in the middle, and also the road lane on the right is free. Take the big freedom. Does it help to launch more cyclists? 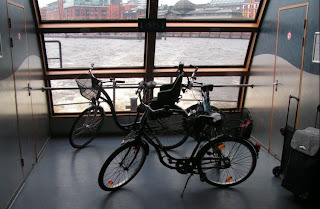 Cycle transport in ferry boats, part of public transport, is very popular. 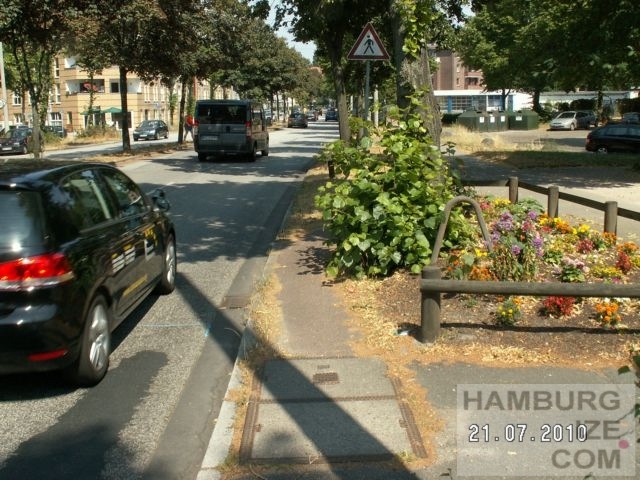 During school holidays from 8th of July to 18th of August the Hamburg Transport Association (HVV) carries bicycles in certain busses, all subways and s-trains around the clock. Usually riding with bicycles is not allowed from 6 to 9 in the morning and from 4 to 6 in the afternoon. 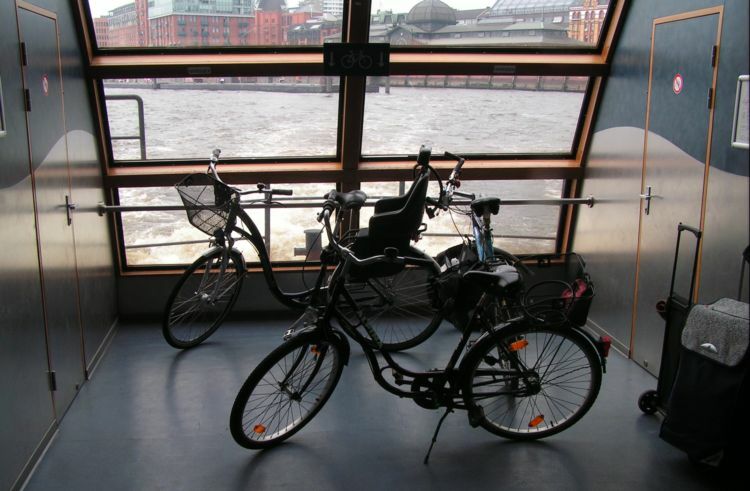 Ferry boats in the harbour are always allowed for cycle transport, and on weekends busses, subways and s-trains are free around the clock. In the Haseldorfer Marsch, an excellent destination for cycle tours, bus line 589 will offer cycle transport on weekends and holidays starting on 24th of July until the 23rd of October. Bus 589 connects the villages Hetlingen, Haseldorf and Haselau with Uetersen and at Wedel with rapid transit to Hamburg city. Cycles will be carried in new trailers. Up to ten cycles can be transported in one trailer. From Hamburg to Wedel the trains need only half an hour, trains and the new bus-trailers are free for cycles of course. Bus-service will be every hour from 10 p.m. to 6 p.m. These weeks the City of Hamburg is painting new cycle lanes in Uhlenhorst along Hofweg and Mühlenkamp. 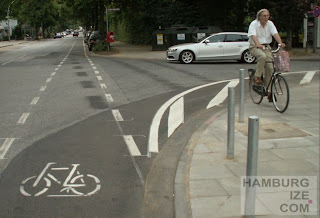 The new lanes are replacement for former old-fashioned small cycle paths. 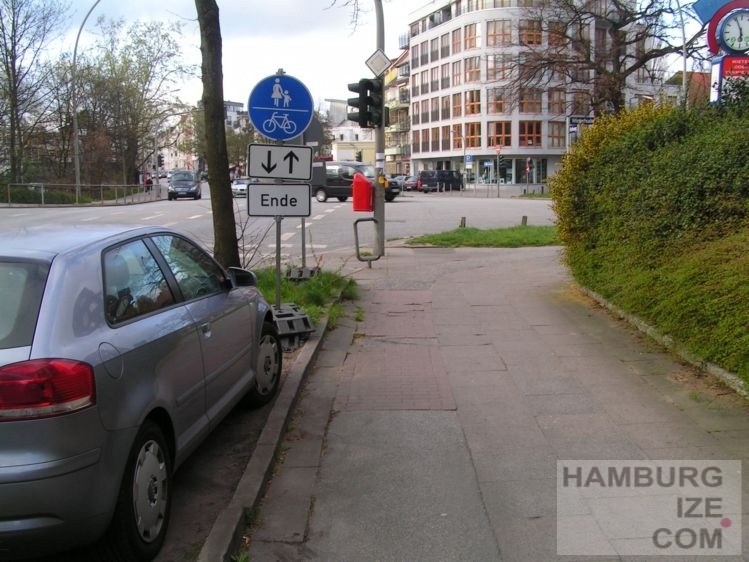 Finally Hamburg gives up narrow cycle paths between parking lots and narrow sidewalks. 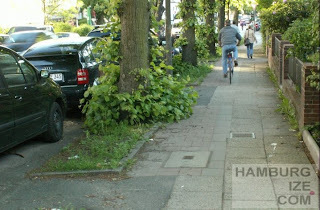 Most of the cyclists never used the old cycle paths but the sidewalks besides - in both directions. Cycle traffic will become now faster und continuously, hopefully. The cycle lanes will not become overgrown and the surface will last longer in good condition than that of sparesly maintained cycle tracks. Even snow and ice could be removed easily. 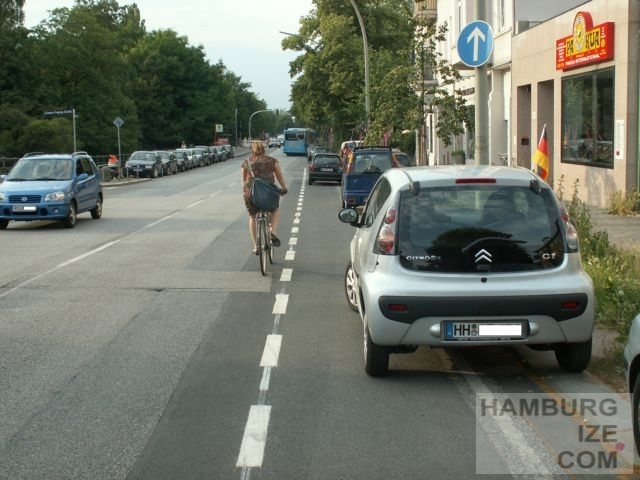 But one problem will be cars parking on the new painted lanes. Hopefully the police will control and keep the new lanes free from cars, the residents with two or more cars will buy cargobikes and sell some of their cars. Hofweg is the longenst part of a long stretch of a main road east of the Alster lake connecting several lower business districts and high level residential areas. The first part of the long stretch is not going to be improved. 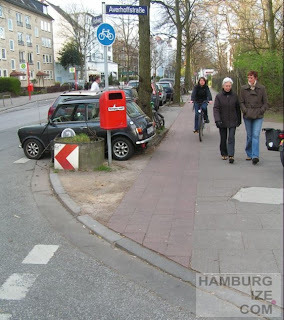 That part in Papenhuder Straße with one of worst cycle paths of Hamburg is left out. Cyclist are now allowed to use the road lanes there, but the bicycle strategy of Hamburg promises to improve all bad cycle paths, even those without the obligation to use. 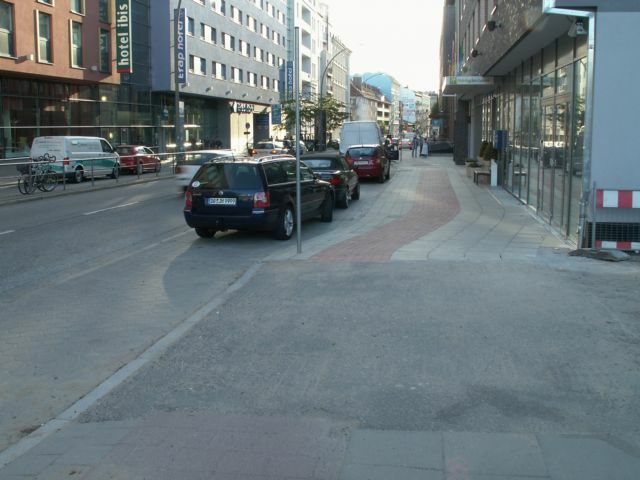 That section offers more parking lots, parking is managed crosswise to the direction of the traffic. The street is wide enough, but it´s all about how to use it. 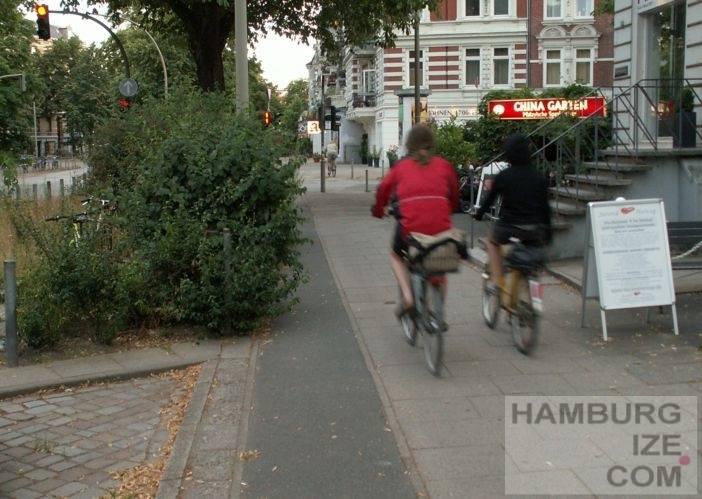 Is it sufficient enough to give cyclist the choice between using the road lane or very bad and meager cycle paths as a tool to increase the cycle traffic? 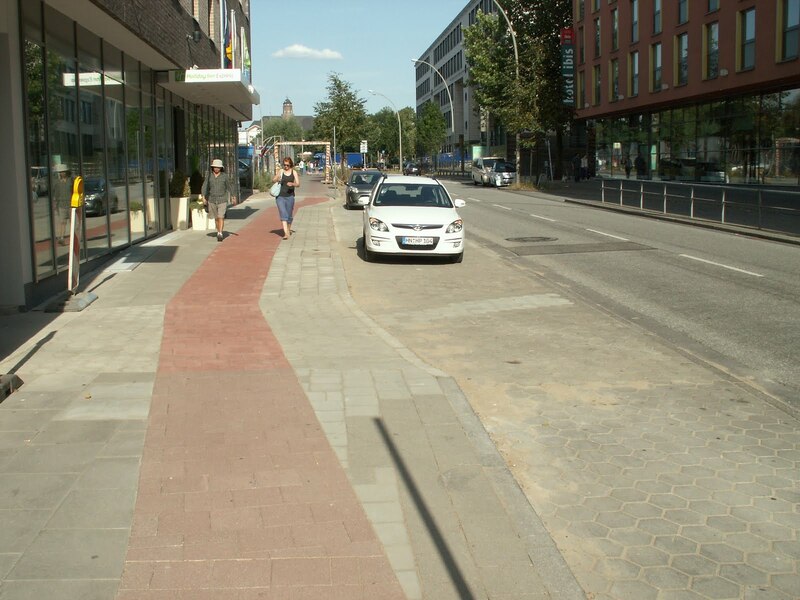 The new cycle lane is about 1.75 m wide to the curb, the old cycle path was o.80 m to 1.20 m wide next to parking cars. Copenhagen just after velo-city global - impressions of the the world´s best cycle city.